Found at the oldest port on the Bruce Coast, the Chantry Island Lighthouse is synonymous with Southampton. Built between 1855 and 1859, and still working today, the Lighthouse has now become a favourite tourist attraction. Whether you just enjoy the view of Chantry Island from the Southampton beaches or soak up the Lighthouse's history by taking a trip on the Peerless, this 150 year old beacon continues to keep sailors safe. 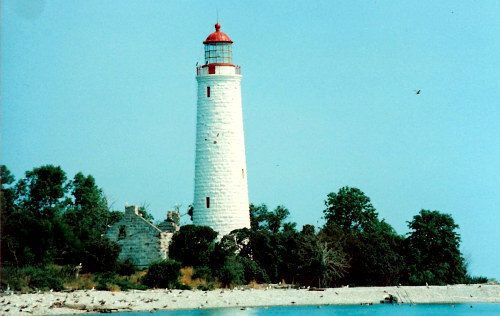 Chantry Island in the 1990's before the buildings were restored. 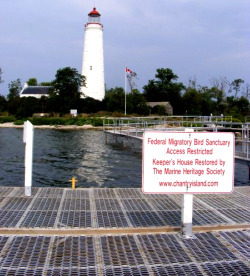 Found approximately a mile off of Southampton's shores, Chantry Island is a federal bird sanctuary. Several species of birds make their home on the island such as cormorants, egrets and herons. It is one of the most important migratory bird nesting sites south of James Bay. Keep this in mind if you decide to take a trip over to the island, the smell is better after a rain. Operating for 150 plus years the Chantry Island Lighthouse has an important job warning sailors of the islands rocky and treacherous shores. The area around the island is home to more than fifty known shipwrecks. While the lighthouse has been operating all this time the buildings were abandoned when the lighthouse went automatic in the 1950's. 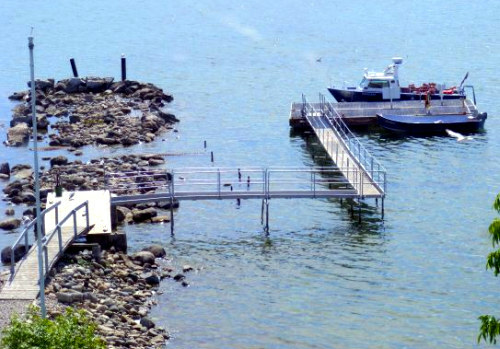 The Long Dock is another historical monument you might still be able to sneak a peak of at the Long Dock Beach, which is also famous for Gerrys Fries. The Long Dock was built in the 1870's and once connected Chantry Island to the mainland, but was left to deteriorate and is barely noticeable any longer. Restoration of the Lighthouse and the surrounding buildings started in the late 1990's and tours to the island have become a fixture departing from the mouth of the Saugeen River since the early 2000's. Though these were not the first organized tours to and from Chantry Island. From the 1930's to the 1950's the Restless brought tourists to and from Port Elgin Harbour. 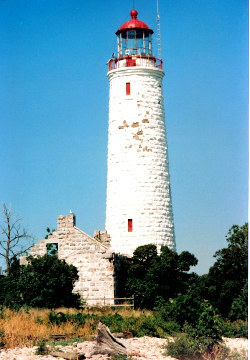 These days to visit Chantry Island you book a lighthouse charter aboard the Peerless weekends from June to September. In August tours are run 7 days a week. Immerse yourself in the history, learning what it was like for the lighthousekeeper, winters on the island and the nautical challenges new settlers had in Southampton. 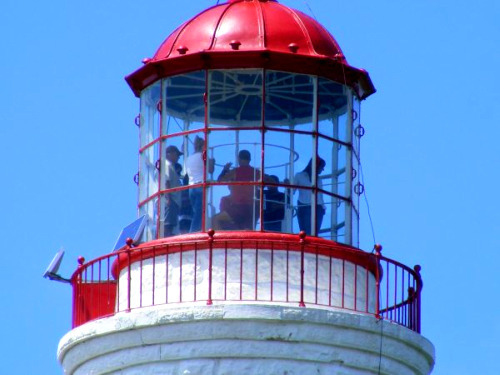 Climb to the top of the lighthouse and see views of the bird sanctuary and the beaches of Southampton. Tours book up quickly so call 1-866-797-5862 to book in advance. View of Chantry Lighthouse from dock - Carol Walberg Southampton's harbour (take Front Street until it ends). While we used to take a small fishing boat over to visit the Chantry Island Lighthouse with our kids, this is no longer recommenced. Respect the effort that has gone into restoring the site, book a ticket and enjoy the ride. Remember sensible footwear (NO FLIP-FLOPS!). Return HOME from the Chantry Island Lighthouse.